By the end of World War I the motion picture industry had begun a serious migration from New York to California. Yet in 1926 when Paramount Pictures decided to build its new headquarters, President Adolf Zuckor chose Times Square for the site. The motion picture giant would make its mark on Broadway – the capitol of the American theater. Architects C. W. Rapp and George L. Rapp of the Chicago-based firm Rapp and Rapp, had designed several Midwestern movie theatres. Now theywere given the substantial Paramount commission. In May of 1926, the cornerstone was laid by Mayor Jimmy Walker. Sealed inside were three copper boxes containing the front pages of New York’s morning newspapers, three five-dollar gold coins, two Paramount feature films and news reels of Admiral Byrd’s Polar expedition. Thomas Edison sent a letter of congratulations. 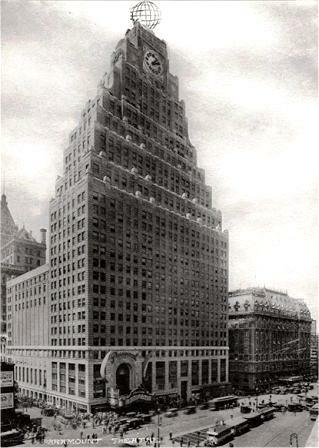 Here on Broadway between 43rd and 44th Streets Rapp and Rapp produced a 33-story Art Deco tower, stair-stepping upward to an enormous four-faced clock surmounted by an illuminated globe. Stars replaced numerals on the clock faces, echoing the stars in the Paramount logo. Paramount spent $13.5 million on their new headquarters, the tallest building on Broadway north of the Woolworth Building. At night the globe could be seen from as far away as New Jersey. On the Broadway side an ornate, curved marquee hung over the entrance to the theater. The lobby inside was modeled after the Paris Opera. Two grand, sweeping staircases curved upwards on either side. An enormous crystal chandelier hung from a baroque ceiling supported by marble columns. The 3,664-seat auditorium was Neo-Renaissance in style with classical busts and statues in recessed niches, gilded detailing, and a frescoed ceiling. Red carpeting led to the stage hung with stories-high red velvet draperies. 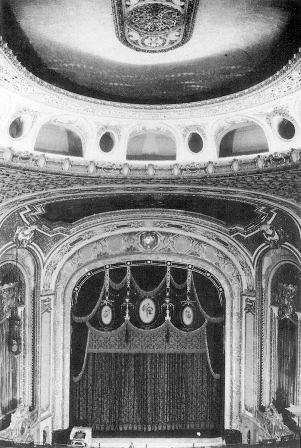 The orchestra pit was situated on hydraulic elevators, enabling it to be raised and lowered as needed. 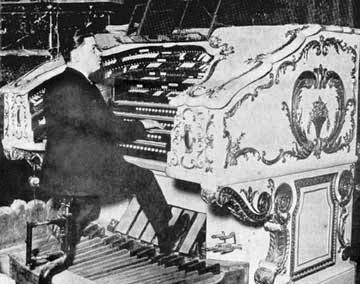 The coup-de-grace was the “Dowager Empress,” one of the largest pipe organs ever built by Wurlitzer. 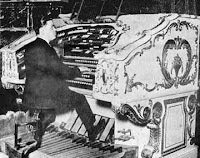 Music accompanying the silent films emanated from the organ’s 33 tons of pipes and 36 ranks. Opening on November 19, 1926, the theater took in a staggering $80,000 the first week. 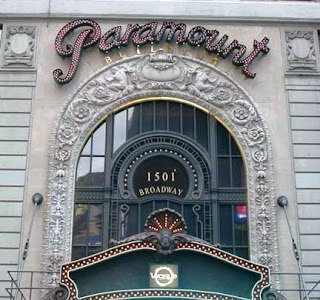 Paramount used its New York theater to premier many of its films, introducing stars like Mae West, Claudette Colbert and William Powell. But the Great Depression made movie-going an avoidable luxury. Through the early 1930s the venue was barely profitable. In an effort to boost attendance, the Paramount’s managers added live music as the Swing Era took hold. 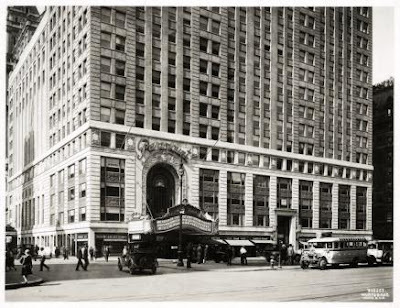 In December 1935 Glen Gray’s orchestra played here. And the public loved it. Big bands became a staple of the Paramount, offering the music of the biggest names in American swing: Tommy Dorsey, Xavier Cugat, Fred Warring, Benny Goodman, Glenn Miller, the Andrews Sisters, Guy Lombardo, Eddy Duchin, Harry James, Phil Spitalny and Gene Krupa among them. As the years passed, entertainers like Jack Benny, Dean Martin and Jerry Lewis, and Frank Sinatra would work the Paramount audience. In 1944 with the advent of World War II and the accompanying “black-out” orders, both the clock and the globe were painted black. They would remain that way until their restoration in 1996. Famous 1950s music promoter Alan Freed used the Paramount to stage live rock-and-roll shows, spotlighting hot new talent like Buddy Holly and the Crickets. Here, too, Elvis Presley’s first movie, “Love Me Tender,” premiered on November 15, 1956. Thousands of fans crushed onto Broadway on opening night, under a 40-foot Elvis Presley cut-out. The popularity of television in the 1960s and the decline of the Broadway neighborhood devastated the theatre’s revenues. After the final screening of “The Carpetbaggers” on August 4, 1964 Paramount padlocked the doors to the palatial theater. Within weeks the grand staircase was gone. The frescoes were destroyed. The chandeliers were sold. All traces of the lavish movie palace were obliterated as the space was converted into stores and offices. The mammoth organ was moved to a Wichita, Kansas convention center. 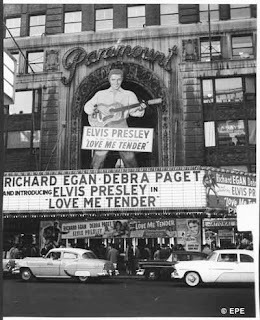 The familiar marquee that once held the over-sized cut-out of Elvis Presley and had announced the movies of Gary Cooper, Gloria Swanson and Rudolph Valentino was removed and destroyed. Then in 2000, the World Wrestling Federation leased 47,500 square feet of the Paramount Building, spending $38 million to create WWF New York – a wrestling-themed restaurant, retail store and club. Astoundingly, the group painstakingly recreated the original Paramount Theater marquee and arch at a cost of $8 million, including the Paramount logo. Although WWF New York was relatively short-lived, the Paramount arch and marquee survive. 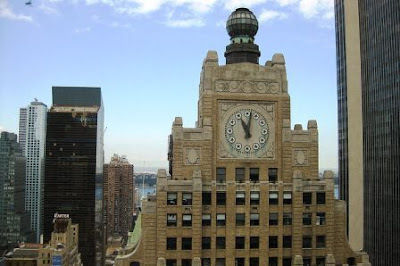 The 33-story Paramount Building is an iconic presence in the Broadway Theatre District. Every day at 1:45 pm and 7:45 pm the giant clock atop the building chimes, alerting Broadway theater-goers that they have 15 minutes before curtain.